I went to medi-ya, the Japanese supermarket in Clarke quay. As soon as I got home, I started cooking! 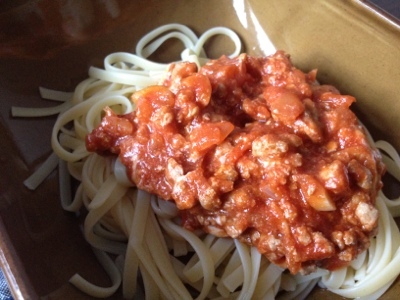 I cooked a lot of things but I realised I hadn't finished the pasta sauce I made few days ago. 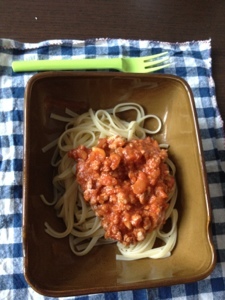 So after all the cooking, my dinner became bolognese spaghetti . 1. Mince the onion&garlic. Heat up a pan with some olive oil, cook the onion &garlic. 2. Add the pork mince. Once the pork is cooked, add the canned tomato and herbs. If too thick, add some water. 3. serve on spaghetti, add some cheese on top while it's still hot! If you make extra, you can use it to make lasagna on the next day!